Whether you’re serious about hiking, or you’re just starting out as a walker, you’ll find a wealth of opportunities for both in the Lake District. The stunning landscape has both level walks across grassy slopes and more challenging scramble trails across the impressive mountain crags. Whatever type of trek you’re looking for, the Lake District has hundreds for all skill-sets and holiday styles. But first, what is the difference between walking and hiking? Ultimately, there is no difference between walking and hiking, although typically a hike will involve walking along a specific hiking trail. These are natural trails, rather than man-made pathways and so they can involve trekking through woods and forests, up mountains, across rivers and National Parks. Hiking means walking over a multitude of surfaces, from craggy outcrops to uneven forest floors. Hiking requires the right gear, such as proper walking boots with plenty of grip and high-quality waterproofs. Also, because hiking often involves going into rural places, basic survival gear and good navigational equipment are essential. An official map of the area, a compass, plenty of water and a means of contacting someone for help are all necessary if you’re hiking in the Lake District. There are an abundance of beautiful trails and destinations that are only reachable by foot in the Lakes: from forest adventures to rugged mountain scrambles, here are some of the best places to go hiking. This iconic and varied walk is just over 6 miles long, and begins in the village of Coniston, with impressive views over Coniston Water. The Old Man of Coniston is a mountain which reaches 800m and the circular walk around it is a great one for both casual and experienced hikers, although you may want to incorporate with other walks as this one only lasts around 3.5 hours. With plenty of sights to see along the way, including abandoned mining quarries and stunning views of the surrounding mountains, the hike includes some steep climbs and a little scrambling here and there. Any hikers who visit the Lake District will find the pull of climbing England’s highest mountain irresistible. Scafell Pike is 978 metres high, and the climb to the top is not for the fainthearted. The whole hike to the summit is steep and will involve scrambling up crags (make sure you have good walking boots and all the other equipment you need for this). There are three main trails you can follow to reach the top of Scafell Pike – all of which have their own charm and offer stunning views of the landscape. Make sure you plan your route before setting off and check the weather. The Catbells Lakeland Walk in a short but steep hike up Catbells mountain. The beautiful fell offers stunning views of the Lake District from all sides. Start off your walk in Keswick and enjoy a challenging but relatively quick climb to the top, beginning with a path and ending with a quick scramble to the very top. For more breathtaking views of the Lakes, enjoy one of the many hikes up Buttermere. There are lots of climbs to choose from, the majority of which are steep and some involve climbing as well as walking. Hikers hoping to climb Buttermere should carry all the right equipment, including a hiking stick and good walking boots. This iconic mountain is the third biggest in the Lake District, at an impressive 950 metres. The shortest route to the top will take the average walker around 3 hours and begins in Thirlmere. For a longer climb, slightly more challenging terrain and even more beautiful views, take the Striding Edge hike – just be prepared for some scrambling and carry the right equipment for the job. This hike is great for serious hikers, but it is also a great activity for anyone else visiting the Lake District, as it has views of the area like nowhere else. Derwentwater is called ‘Queen of the Lakes’: a vast expanse of crystal clear, trout-filled water surrounded by beautiful slopes, ancient forests and craggy mountains – the ideal picnic spot or holiday home location. The Derwentwater walk is 10 miles long and offers a view of all the best parts of the Lake District. There are lots of sights to see along the way, including the National Trust’s Hundred Year Stone and the Ruskin Memorial and if you’re lucky, you might catch a glimpse of a red squirrel, which is still thriving in the Lake District. 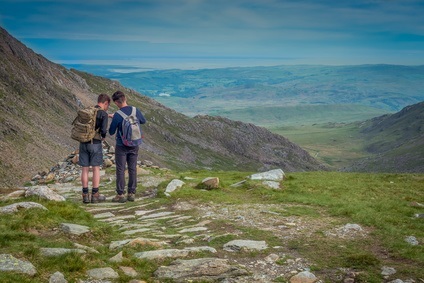 With so many stunning views to reach, wildlife to see, and off-road excursion routes to explore, the Lake District is one of the best places in the UK for hikers of all levels.